IOWA CITY, IOWA – The University of Iowa in Iowa City and the IowaWORKS Center in Cedar Rapids, together with the U.S. Department of Labor/Office of Apprenticeship, launched a heating, ventilation and air conditioning (HVAC) Registered Apprenticeship Program. A Registered Apprenticeship is employer-driven training combined with on-the-job learning and related classroom instruction. The program allows the Registered Apprentice to earn a paycheck from day one while learning. The HVAC Registered Apprenticeship is a four-year program with the classroom training provided through ABC of Iowa Apprenticeship and Training Trust. Carrie Mahon, a human resources generalist for the University of Iowa – Facilities Management, said they decided to offer a Registered Apprenticeship Program because their operation wanted to provide the necessary on-the-job training for this highly essential skill here on the University of Iowa campus. 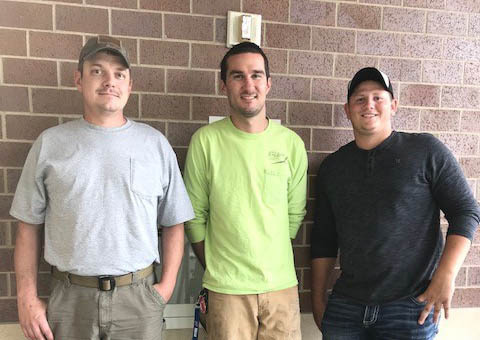 Three individuals were hired as Registered Apprentices in the HVAC program: Hunter Smith, Charles Gerace and Brian Marshall. Gerace said he is honored to be selected for the program. Registered Apprenticeship Programs help recruit, develop a skilled workforce and retain talent. There are currently more than 1,000 apprentice able occupations in industries that include energy, information technology, healthcare, financial services, transportation, advanced manufacturing, food and beverage preparation, and the building trades.